I had a number of breakthroughs during my magical Mexican mystery tour and I’ve had a few since. Most of them have involved discomfort or emotional pain, as breakthroughs so often do. Note to self: if you’re feeling pain, don’t be afraid of it, don’t run from it and don’t overeat on it. Embrace it, sit with it, cry through it, process it – it’s likely a sign of imminent growth. And growth, however much it hurts, is a lot more desirable than stagnation. One of the more significant breakthroughs was about men and how I relate to them. Now, if you’re single and of a certain age, you’ll have heard this kind of thing many times before. You’ll have been told you’ll meet someone when you’ve learned to be happy without him, when you don’t need him, when you’ve stopped looking for him. It’s a state of being that many singletons strive for. We pursue fulfilling work, cultivate interesting hobbies, take adventurous holidays, invest in our friendships and relish sleeping in a large double bed without having to listen to someone else’s snoring. But while we might look delighted with our singleness on the surface, getting to that place on the inside, deep within our hearts, is easier said than done. I’m speaking from experience. Anyone who knows me will vouch for the fact I lead a pretty full life. I’m sure I don’t enjoy my independence as much as I could but I was out at the movies on Thursday evening, salsa dancing on Friday night and I’ve just got back from a month of travelling, surfing, and partying in Mexico. So I don’t do too badly – at least on the outside. But at a deeper level, there’s often a longing – for partnership, for companionship, for love, for intimacy (into-me-see – to be known and to know). And there’s often a loneliness, which I try my best to avoid, often through constant activity, but that generally catches up with me. My recent holiday romance – while imperfect and short-lived – reminded me how great it can be to be in partnership. But it also led me to a breakthrough around my singleness. Towards the end of my Mexico trip and a good week or so into my romantic interlude, I stood at a crossroads. The guy, over breakfast, had floated the idea of me staying on in Mexico to travel some more. In my sun-kissed dreamy state, I had taken this to mean to travel some more with him – an attractive prospect given how much fun I was having. Of course, my first thought was that I couldn’t possibly do that. I was a ‘good girl’. I had a flight to catch, a schedule to keep to, admin to complete, a tax return to file, work to do, money to earn, a routine to return to and so forth. Of course I could stay – perhaps only for a few weeks (semi-safe, moderately risky) – but I was ready and willing to break the mould, to take a chance, to do things differently. But on announcing my intention, I discovered that what I had heard hadn’t actually been an invite to stay on and travel with the guy. It had been a suggestion to continue an adventure that obviously was doing me the world of good – but not as part of a couple. Our relationship had a beginning and an end and the end was nigh. We’d had a great run but he was a solo traveller on a journey of self-discovery. It was time to go our separate ways. Fair enough. I’d signed up to a holiday romance and that’s what I’d got – nothing more, nothing less. But that knowledge didn’t stop me from feeling angry, hurt and rejected. I felt on the receiving end of that familiar push-pull dynamic that I’ve subjected men to on numerous occasions – the ‘I want you but I don’t want you’ message. I’ve touched on this before in previous posts: Taking the plunge, Waiting for my honeymoon and Be still my beating heart. And when I say I felt angry, that’s a bit of an understatement. I was fuming. Not even a fast swim in a choppy sea could soothe me. Talking it through, however, with the guy in question and being honest about what was going on inside my head and heart succeeded in calming my fury. As we sat chatting in a sandy hollow looking out to sea, I saw (and I see even more clearly now) that while I had some justification for my feelings, my reaction had been disproportionate to the situation before me, which was a clear sign that something deeper had been stirred. To recall the title of a previous blog post, my reaction was a touch hysterical, hence there was something historical going on. My past had invaded my present. The sense of rejection and the depth of anger I felt had very little to do with the man sat beside me on that Mexican beach and a lot to do with the very first man who, in my eyes, had loved me and then left, who had wanted me but then hadn’t: my Dad. My fury, my indignation, my desire to lash out belonged to the eight-year-old girl who had sat quietly on her father’s knee as he explained in regretful tones that he was moving out, rather than to the 41-year-old woman who felt a little jilted by her temporary fella. And that vulnerable little girl who never knew where to take her pain lives on inside me, poised to react to any hint of abandonment. These days, it’s up to me to listen to her, to soothe her and to help her process her feelings. But then (we’re back on the Mexican beach), once I’d worked through my anger and had separated my past from my present, I had the real breakthrough – not unlike the epiphany Dawn French had on her Cornish coastal walk. I was a single, capable, independent, Spanish-speaking, Mexican culture-loving, salsa-dancing adventurer. I could travel on my own. I didn’t need this man. I didn’t need any man. In fact, perhaps it would actually be more exciting to continue this adventure solo. By this point, after nearly 4 weeks in Mexico, I’d got over my initial trepidation and had been well and truly infected, once again, by the travel bug. The prospect of an overnight bus ride to the jungles of Chiapas followed by a visit to Palenque and a stopover in Oaxaca on the way back to the capital – on my own – suddenly seemed like the most exciting thing I could possibly do. Think of all the new experiences I could have, all the interesting people I could meet, all the sights I could see. So after a good deal of indecision (one of my main coping mechanisms when gripped with fear), I made a choice: I would change my flight, postpone the work I had planned back in London or arrange to do it from a Mexican Internet café, miss a number of appointments and travel for a bit longer. And I would do this without the security of this man – or any man. I’d do it because that’s where my heart was leading me and I was brave enough to follow. 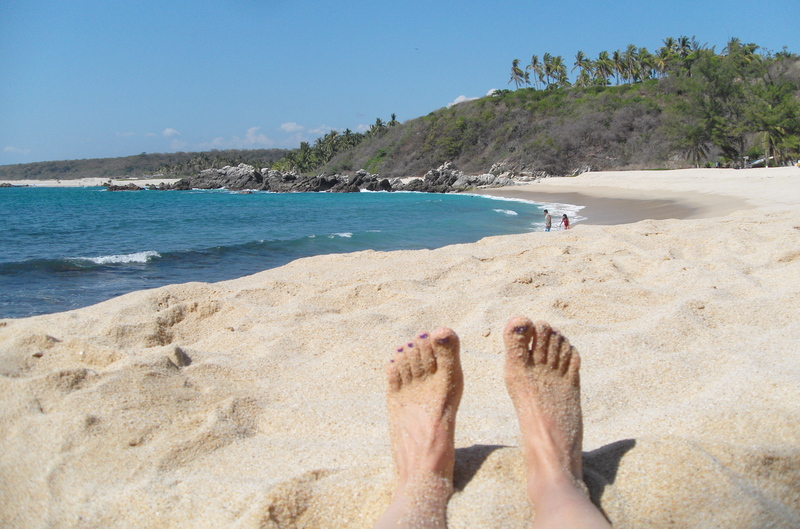 After all, I’d followed my heart to Mexico over Christmas and to Puerto Escondido when I didn’t know where else to go. As it turns out, once I’d made the decision to stay and after I’d cancelled an internal flight to Mexico City, my plan hit a brick wall. I couldn’t change my flight home to London. I’d been told I could, several times over the phone, but in fact, when it came down to it, I couldn’t. No way, José. But it didn’t matter. The breakthrough had happened. As I realised that I didn’t need a man to enjoy my time in Mexico or to feel safe in a foreign land, I grew a few inches. The pain and anger I’d felt at being rejected, as I saw it, had opened the door to an extraordinary discovery – that I could do this on my own. No problemo. And it’s that moment I hold on to more than any others from my Mexico trip. It’s that moment that gave me back my adventurous spirit and filled my head and heart with dreams of future journeys. Since I got back to London – two-and-a-half-weeks ago now – I had another breakthrough and along similar lines. Despite having walked away from my holiday romance feeling emotionally strong, I suddenly found myself experiencing a whole different set of emotions toward the guy in question, emotions similar to those that had gripped me on that Mexican beach: anger, resentment, hurt and a sense of betrayal. I wanted to break all contact with him, shut him out, end our friendship, pull down the shutters, batten down the hatches and pull up the draw bridge. I began to think I’d been wrong to get involved, to let myself live in the moment, to open my heart, to experience glimpses of intimacy, closeness and companionship. What had been the point? Only to feel rejected, lonely and hurt afterwards? It wasn’t worth it. But once again, the ‘hysterical – historical’ maxim came to my rescue. The feelings of anger, hurt and betrayal weren’t to do with him. This guy had done nothing wrong. He’d laid his cards on the table at the start and had hung around a lot longer than expected. There was no betrayal, no rejection, no cause for hurt. No, those feelings dated back decades and belonged to my relationship with my father. I had felt abandoned, betrayed and rejected at a very young age by the most important man in my life. I had done my utmost to bring him back or to get him to love me exactly how I wanted him to: I’d starved myself to the point of developing an eating disorder, I’d got straight ‘A’s at school, been head girl, won a place at Oxford University, run cross-country for Liverpool and captained school sports teams. All, as I saw it, to no avail. Of course, Dad had loved me. He had always loved me – the way he knew how. But it was never enough for me. My need was too great, the hole was too wide, the wound too deep. So what did I do with my hurt? How did I react to this sense of betrayal? I ran. I ran far away. Geographically and emotionally. Australia, New Zealand, Fiji, United States, Mexico, Brazil. I ran for ten years, coming home for brief holidays, never even trying to get close again. I shut him out. I battened down the hatches and pulled down the shutters. I lived in sunny climes but a thin layer of ice covered my heart. Fortunately, it melted in time. I found recovery (from my eating disorder and other addictive behaviours) in time. I found therapy in time. In time to achieve some degree of closeness before he died. In time to spend a week or two beside his hospital bed, helping him pick his meals off the menu or listening to a Liverpool FC match on a portable radio. In time to tell him I loved him and that I was sorry I had thought he hadn’t loved me, that I was sorry I had run so far away and for so long. Of course, it wasn’t enough time. It never is. There was so much more I wanted to say. There was still a gap I wanted to bridge. And maybe I’ll always question my choice to take a 3-week holiday – in Mexico of all places – in February 2006. I thought he had more time. I thought we had more time. As it was, he died just days after I got back and while I got the chance to see him before he passed away, I never saw him conscious again. There wasn’t enough time. But there is still time to heal, to heal the wounds of the past by exposing my heart to love in the present – however much that triggers painful memories, however scary and crazy-making it can be, however much I instantly want to retreat behind my protective walls. It has been said that our greatest hurt happens in relationship – and that is where the healing happens too. Breakthrough: an action or event that represents the removal of a previously existing obstacle or barrier to progress. Breakthroughs happen when we take a chance, when we do things differently, when we face our fears. And every time we process our pain, work through our past and learn to live in our present, we chip away at the obstacles that stand in the way of progress, that stand in the way of happiness. This entry was posted in Love, Recovery, Relationships, Travel, Women and tagged addiction, breakthroughs, healing, inner child, intimacy, Mexico, push-pull, Recovery, Relationships, Travel. Bookmark the permalink. Thank you for reading – and for writing!